Feel free to share these “cheat sheets” with your friends and colleagues. Move your mouse over a filename link and press right-click with your mouse and then choose “Save as” (or similar wording depending on your browser) to save the file to your disk. On Mac OS X, press the ctrl key and the mouse. Hi, I’ve just downloaded part 1 of your tutorial and am starting on the calculator app, its really well explained and I’m sure I can adapt it to make a bulk concrete calc for a friend who has a construction company. I’ve used VB6 to set one up on his PC but having an app on his phone or tablet to use when out on site would be even better. I’m looking forward to part 2, I would like to use my phone as a strobe light to examine rotating equipment in my shop, and a couple of other ideas for my business. Anyway keep up the good work and btw charge a bit more its worth it. Hi Colin and thank you for your comments. That is a really neat application idea – using the phone as a strobe light to check out rotating equipment. Similar to how we use a timing light to set the mechanical timing position on a car engine, I imagine. Very neat idea. It should be possible to flash the screen, but it may depend on how accurate the timing needs to be, and the frequency of the light flashes. I have not tried anything like that – but it is a very cool application idea. I just discovered AppInventor, and I am not to the productivity point yet, but I though I’d comment anyway. 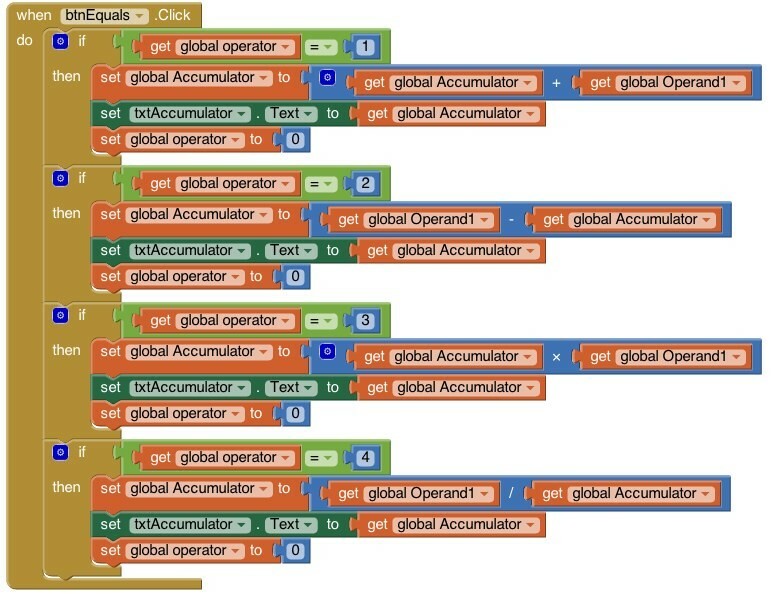 Your book is straightforward English and the AppInventor system and tools make sense now. It seems to be the plain English docs I was looking for. I just discovered AppInventor, and I am not to the productivity point yet, but I though I’d comment anyway. Your book seems to be the plain English docs I was looking for. Thank you for the feedback! My goal is to try and present each part of App Inventor in a simple, step-by-step way. As I note in the book intro and on this blog, there are many great App Inventor tutorials and web sites – but most focus on K-12 education, whereas my interest is on the types of applications that adults/professionals would like to do. Others present nice examples but usually within a very complex example program – which may make it hard to understand how just one feature – and the one you’d like to understand – work! I have a few more posts almost ready to up on this blog – its been a very busy past few days though! Hi,Thanks for your efforts.I downloaded the zip files and practisse some apps. I have problem in save .apk file. Are you saving the .apk file on your computer or saving it to an Android device? Is this an App Inventor app or some other app? If this is some other app, does the app you are using have a way to save data to csv or xls format? If you can save data from your app into CSV format, then it is possible to transfer that data file from Android to your PC (see below for link). If using App Inventor apps, then it is possible to write code in MIT App Inventor to convert data to the CSV format and store that on a file. Once the data is in a CSV formatted file on your device, the data file can be transferred to your PC. has information at the bottom on how to transfer files from your Android device to your PC. I am really enjoying your tutorial. It is well worth the price. I’ve been trying to learn Rails and Android Studio; I am making great progress with both, but sometimes I need gratification from using App Inventor. Plus, I had no idea App Inventor was as powerful as it was. I would have never known had it not been for your book. Thanks for publishing it. Also, may I kindly offer a suggestion you may want to consider regarding the layout for future updates? Taking, for example, the section “Exchanging Values between Screens”, particularly the images that illustrate. 1. The screenshots and text show up on all my screens very small. Maybe a font of 2 or 3. Perhaps the screenshots and accompanying text could be made two or three times bigger. 2. The color of the blocks has changed from the examples in the book to what I appear to have on my screen. Perhaps it may be easier to keep the screenshots/colors the same, but be a little more explicitly clear about which sort of block is need. I’d even suggest explicitly listing each block needed. The text is sometimes opaque about where each block is, but this could be on me. 3. Sometimes it is a little difficult to tell which screen you mean, ie Screen1 or FindCustomer. Perhaps a little breadcrumb above each screenshot could make it painfully obvious which screen is being referenced. Now of course I can and should be willing to dig a little deeper into the text you wrote and the downloadable projects you kindly provide. My fear is that someone may get frustrated at the not-painfully-obvious screenshots and miss out on the great resource that is your book. I think those are good ideas. I assume you are referring to the web site tutorials and not the e-books? Regardless, you have some good suggestions and I appreciate your taking the time to pass those along! Images that appear on web pages can be clicked on, and that will usually display a larger version of the image. I should note this in the web posts! In about a month, I am considering go through and re-editing all of the web site blog posts to improve them and hopefully I can fix any of these confusing items. Regarding ebook content, my preference is to label each figure or illustration or image with a Figure number, such as Figure 3, and then reference that Figure in the text as something like “as shown in Figure 3”. Amazon’s Kindle author recommendations (at least at the time I started to write the e-books) was to put the images in line and not reference them, when designing for e-books. I will look in to that. Regarding #1, the text font and text size are set by the e-reader software. See if you can use an adjustment to change the text size. Screenshots are always a fixed size in an e-book – I wish there was a way to create variable screen sizes that would appear in different sizes on different types of devices. I recommend, for best viewing, to view the e-books using the e-book e-reader software on a personal computer. E.g. The Amazon Kindle e-reader software. The images look better on a regular screen than on an e-reader. Regarding #2 – could you mention an example of where the color has changed? I do like the idea of listing each block needed, especially in the early volumes, as I know that when learning App Inventor, it can be hard to locate the desired block in the palette. I will look into this. Regarding #3, good suggestion to figure out a way to link these information better. In volume 3, I have already labeled each section with the screen name (or an abbreviation for the screen name). I think this can be improved for volume 1 and 2. Thank you again for your comments – and feel free to ask more questions and offer more suggestions. Your feedback is greatly appreciated! Thank you David! I am amazed at what App Inventor can do – and it makes much of programming much easier than trying to work through the “professional” tools. MIT is in process of adding a new feature that will enable third parties to add components to App Inventor. This means the capabilities of AI2 will continue to grow in to the future. App Inventor has a bright future ahead! Hi, I’ve just purchased your books on Amazon. But the download links are no longer working. Ouch. Obviously, something is broken. I’m traveling without a computer (I’m on my cellphone) and doing I can fix it right now. I have an idea for a simple fix to get it working but doubt I can fix immediately in my current situation. I’ll see if I can send you email with a bit more info. I may have fixed the problem remotely. I hope. In the book you do not mention or show the block for DoArithmatic., however when I downloaded the source code there it was. I cannot find the DoArithmatic block in the procedures blocks. It appears the book text is correct and the downloaded version differs slightly from the book text. Functionally, they will both do the same thing. The difference is that in the download version, the code blocks that appear within the btnEquals.Click handler were re-arranged and placed into something called a “procedure” block named DoArithmetic. The code within DoArithmetic block is identical to the code shown in the e-book text. In the download version the DoArithmetic code is run by using the “call DoArithmetic” block in the btnEquals.Click handler. Either version will run identically. I will likely update the download version to remove the “procedure” code. App Inventor “procedures” are introduced in Volume 2 Chapter 7. I suspect I had modified the Calculator code from volume 1 and inadvertently saved it into the version 1 file (although volume 2 does a completely different implementation of the calculator to introduce user interface improvements). Thank you for bring this to my attention!